As much as we would like to put our website up and forget about it, that is not an option if you want to be successful in the online world we live in these days. Google and other search engines dictate what is important when it comes to SEO and the constant is CONTENT. For the purpose of this article lets just say that Google is all search engines, which most people use anyway. Google uses the search terms of all the people that use its search engine to create what is relevant. The question we need to know is what is important for our success? What Content Should We Put In Our Website? Well we all know our business and what we are selling but what are people searching for to find our service? Of course the first thing we think of is to look at our competitors site and use similar content but what is even a better idea is to go to the source, Google. Google will tell you the related search terms for a specific service that you offer. As you can see from the picture on the left, we did a search for microneedling and a list of search terms came up in the dropdown menu. These are all related search terms and can be used in the content of your website, as headers (titles) for your pages and topics to write articles (blogs) about. Another simple way to get relevant keywords is to look at the bottom of a searched page. 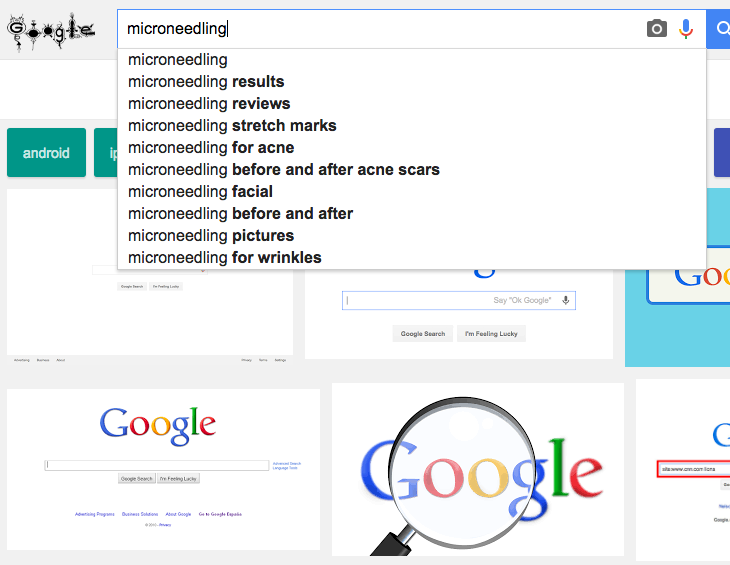 Place a keyword in Google Search Bar, Ex Microneedling. As you can see from the picture on the right, when you search for a keyword in google, Related Search Terms appear at the bottom of the page. These terms again can be used in website content. The ultimate place to find related keywords is within Google Adwords. You actually can sign up for a free account as long as you have a gmail email address. If you don’t, just create one, it is free also. 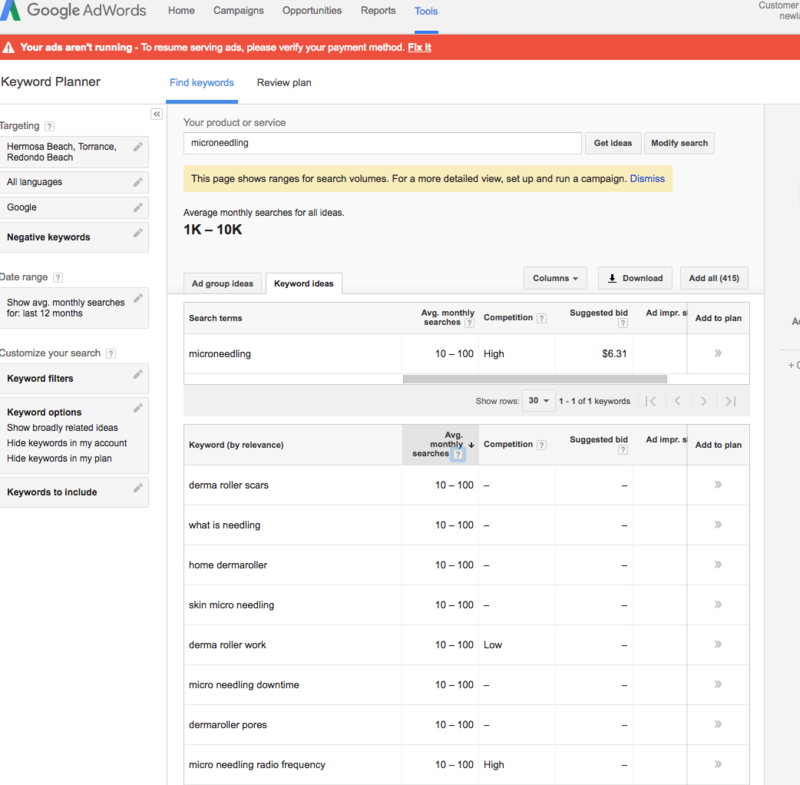 Once you get into the Adwords page, click on Keyword Planner then Search for new keywords using a phrase or term. You can narrow down the search based on area to see exactly what customers in your area are searching. Its a great tool to help with website content. Once each page of your website is optimized this way, you can check Google Analytics, which is free, to see if people are engaging within your site. Make sure you give your website 1-2 weeks to get some traffic before analyzing data. 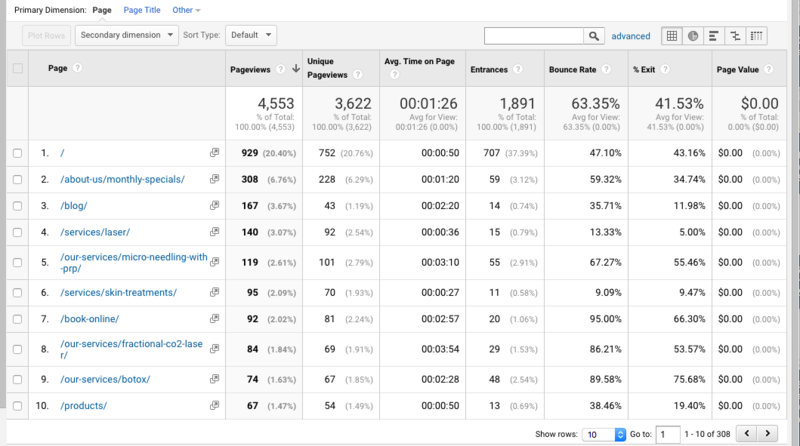 Most people will need some help from a web developer to set up Google Analytics within your website but once it is running it is easy to view results. As much as you do not want to hear it, your website is a living document that needs to analyzed and updated regularly. Use the above ideas to create relevant website content to keep your customers interested and the rewards will be seen with new patients walking through your doors. MD Needle Pen, Educating Our Practitioners for Success. 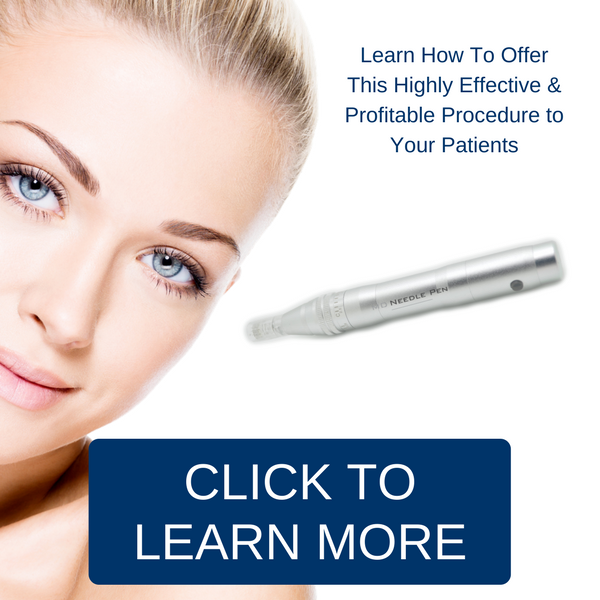 Interested in Growing Your Practice with Microneedling? What is the PRP Facial? 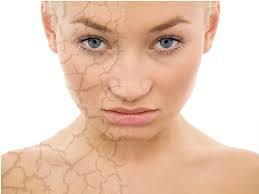 Can Micro Needling Really Make Acne Scars Disappear? Is Microneedling Effective or Plain Dangerous? Can Microneedling Help Tackle Acne Scars? © 2019 MD Needle Pen.